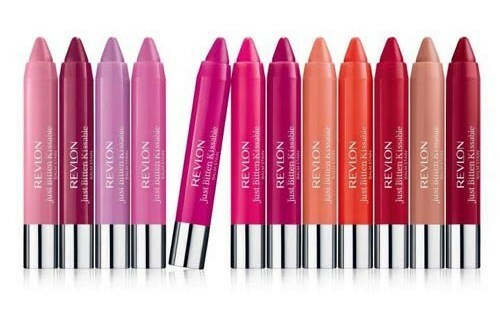 Earlier this year Revlon released the Just Bitten Kissable Balm Stains in America. Naturally I was excited by the hype that surrounded them and I purchased two off eBay. I used them a couple of times and being the lip product junkie I am, new lip goodies were purchased and these were pushed to the back of the drawer. I pretty much forgot about them... Oops! I was reminded though when I heard that they are being released in Australia this November. There are 12 shades available (only in America) and I chose two of the brighter ones. The first is 025 Sweetheart and it is is a bright pink and the second is 040 Rendezvous which is an orange-coral. Each contain 2.7g of product. The first thing I noticed when applying these is how pigmented they are. It is full on colour! I was expecting something similar to the Clinique Chubby Sticks which is a sheer, glossy colour. The Just Bitten Kissable Balm Stains are a glossy, pigmented colour. They do have similar packaging though - crayon shaped and wind up. Which means no sharpening, always a good thing. When first applied on the lips they are quite glossy. As they wear the glossiness fades but the colour really stays. No touch-ups are needed to keep the colour on your lips. The stain does fade during the day but is still noticeable after many hours and I have found it fades evenly. No nasty looking ring of colour around the lips. On application they are quite moisturising on the lips, of course as the glossiness wears away the moisturising effect does too. I have found they are not too drying on the lips but are a little bit. It is very easy to apply a lip balm over the top of the stain. This is no hassle for me, having dry lips I am always reaching for the lip balm. Another, quite noticeable point is they have a minty taste and scent. It is pretty strong when first applied to the lips but does fade. Just something to consider for those sensitive to scented products. I do quite like the Revlon Just Bitten Kissable Balm Stains and now that I have rediscovered them, I will definitely use them more. When I see them in store I think I will pick up another shade or two, especially a lighter pink. Revlon Just Bitten Kissable Balm Stains are being released in November and will retail for AU$17.95 each, though only 10 shades will be available. Have you tried the Revlon Just Bitten Kissable Balm Stains? What are your thoughts? These are the two colours that I have my eye on! Hopefully they aren't too expensive in Oz!